Is quilting with your sewing machine a drag? Not with our Galaxy line! The 8370 Quilter's 7th Heaven sewing cabinet has almost as big of a hit as her sister, the 8300 Quilter's Cloud 9. 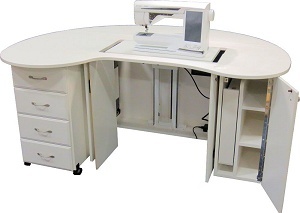 The large desk top with round curves and rounded edges allows fabrics to flow easily as you work. A HUGE 29" by 13 1/4" opening (order insert 29x14) with our heavy duty Electric Lift, the 8370, Quilter's 7th Heaven, handles the largest sewing machines that we know of and plenty of room on top for their embroidery modules. Added space on the right allows room for a computer and storage shelves with a handy thread drawer for your favorite threads and common tools. 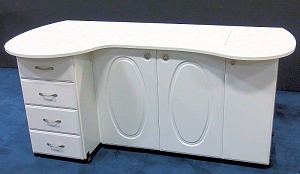 The large soft close drawers and the Electric Lift make it a must for any Quilter using a sewing machine. Available in White and for a little extra, Rustic Maple. Our optional embroidery Module Rack mounts on the left side for Embroidery module storage. (see Module Rack for details). Pocket doors hide inside to make use of the right side. The large leaf in the back folds down for flat storage against a wall. 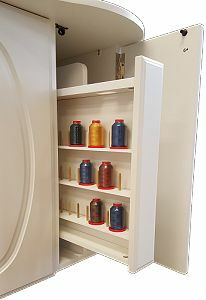 The thread drawer holds up to 30 spools of standard size thread, has place for scizzors, rotary cutter, tool tray and soft close glides as well. Opening for machine is 29" by 13 1/4"